Last month I posted a link to a tutorial video that I had made showing how to use my add-on SimpleBake for Blender 2.8 to export models and textures for upload to Sketchfab. I have now put the hard work that went into making that video to waste.... as the most recent version of SimpleBake (version 2.5) now incorporates a Sketchfab up-loader directly. The manual upload process is no longer needed (though is still possible). SimpleBake is a one-click solution for baking textures (particularly PBR texture maps) in Blender 2.8, likely to be of particular interest to game developers and Sketchfab users. 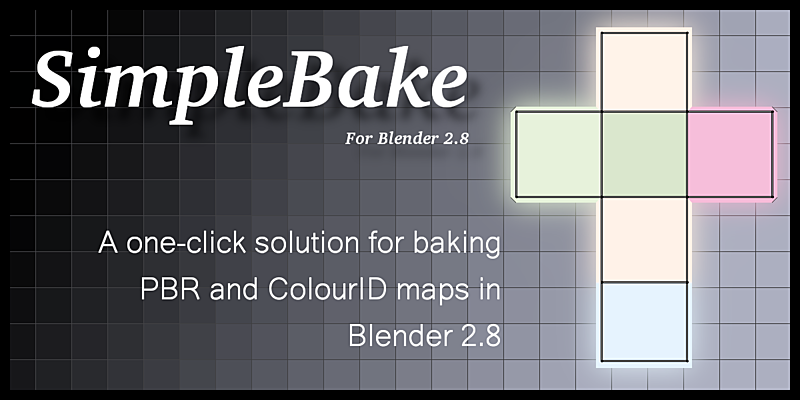 Check out SimpleBake on Blender Market to see if it might be of use to you (particularly the FAQs, which have a lot of detail). One-click solution for baking PBR texture maps (diffuse, roughness, metalness, normal etc.) in Blender 2.8 for any materials built around the Principled BSDF and Emission shaders. No new work flows, no special node groups. Use as many Principled and Emission shaders as you like, and mix them as you like. Feed input into those shaders however you like. Use as many materials on your objects as you like. Bake PBR maps from several objects (e.g. high poly) to one target object (e.g. low poly). Useful for game development workflows. Bake multiple objects to one set of PBR maps. Useful for game development workflows. Also bake any of the “traditional” Cycles bake modes (combined, glossy etc.). SimpleBake handles the image and node creation in the same way as PBR baking. Also compatible with baking multiple objects to one image in the same way as PBR baking described above. Create colour ID maps (one colour per Blender material). Useful for exporting to other programs like Substance Painter. Automatically generate new UVs as part of the bake (Smart UV Project) with the option to adjust the island margin. Create a copy of your objects in your Blender scene with the baked textures instantly applied as part of the bake process. Bake with or without alpha background. Take advantage of multiple configuration tweaks “behind the scenes” to ensure that baking in Blender 2.8 is fast and accurate. I am a casual Blender that has recently moved into creating Blender add-ons. Simplifies the creation of PBR materials to a SINGLE click!